For years, the Kingdom of Araluen has prospered, with the evil lord Morgarath safely behind the impassable mountains. For years, its people have felt secure. but the scheming hand of the dark lord has not been idle. . . . on a special mission for the rangers, will and his friend Horace, an apprentice knight, travel to a neighboring village and discover the unsettling truth: All the villagers have either been slain or captured. but why? Could it be that Morgarath has finally devised a plan to bring his legions over the supposedly insurmountable pass? if so, the king?s army is in imminent danger of being crushed in a fierce ambush. And will and Horace are the only ones who can save them. Halt and Will had been trailing the Wargals for three days. The four heavy-bodied, brutish creatures, foot soldiers of the rebel warlord Morgarath, had been sighted passing through Redmont Fief, heading north. Once word reached the Ranger, he had set out to intercept them, accompanied by his young apprentice. "Where could they have come from, Halt?" Will asked during one of their short rest stops. "Surely we've got Three Step Pass well and truly bottled up by now." Three Step Pass provided the only real access between the Kingdom of Araluen and the Mountains of Rain and Night, where Morgarath had his headquarters. Now that the kingdom was preparing for the coming war with Morgarath, a company of infantry and archers had been sent to reinforce the small permanent garrison at the narrow pass until the main army could assemble. "That's the only place where they can come in sizable numbers," Halt agreed. "But a small party like this could slip into the kingdom by way of the barrier cliffs." Morgarath's domain was an inhospitable mountain plateau that towered high above the southern reaches of the kingdom. From Three Step Pass in the east, a line of sheer, precipitous cliffs ran roughly due west, forming the border between the plateau and Araluen. As the cliffs swung southwest, they plunged into another obstacle called the Fissure—a huge split in the earth that ran out to the sea, and separated Morgarath's lands from the kingdom of the Celts. It was these natural fortifications that had kept Araluen, and neighboring Celtica, safe from Morgarath's armies for the past sixteen years. Conversely, they also provided the rebel warlord with protection from Araluen's forces. "I thought those cliffs were impassable," Will said. Halt allowed himself a grim smile. "Nowhere is ever really impassable. Particularly if you have no respect for how many lives you lose trying to prove the fact. My guess is that they used ropes and grapnels and waited for a moonless night and bad weather. That way, they could slip past the border patrols." He stood, signifying that their rest stop was at an end. Will rose with him and they moved toward their horses. Halt gave a small grunt as he swung into the saddle. The wound he had suffered in the battle with the two Kalkara still troubled him a little. "My main concern isn't where they came from," he continued. "It's where they're heading, and what they have in mind." The words were barely spoken when they heard a shout from somewhere ahead of them, followed by a commotion of grunting and, finally, the clash of weapons. "And we may be about to find out!" Halt finished. He urged Abelard into a gallop, controlling the horse with his knees as his hands effortlessly selected an arrow and nocked it to the string of his massive longbow. Will scrambled into Tug's saddle and galloped after him. He couldn't match Halt's hands-free riding skill. He needed his right hand for the reins as he held his own bow ready in his left. They were riding through sparse woodland, leaving it to the surefooted Ranger horses to pick the best route. Suddenly, they burst clear of the trees into a wide meadow. Abelard, under his rider's urging, slid to a stop, Tug following suit beside him. Dropping the reins to Tug's neck, Will instinctively reached for an arrow from his quiver and nocked it ready. 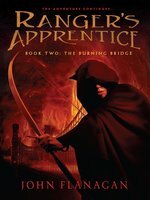 ethan_q - This book is the second book in the Ranger's Apprentice series. This book starts off where Will, his friend Horace, and the Ranger Gilan travel to Celtica, a neighbouring country to Araluen. They discover that everyone has vanished. Will and Horace wonder if every villager has been either killed captured, but Gilan believes that the evil Lord Morgarath devised a plan to cross the mountain pass faster. If that were true, and the King wasn't warned, the country would be destroyed. After a while, they discover that the king’s army is in danger of being destroyed in a treacherous ambush. Only Will, Horace, and a girl named Evanlyn, stand between them. This book is a good book, I would recommend this book to people who have already finshed the first one. 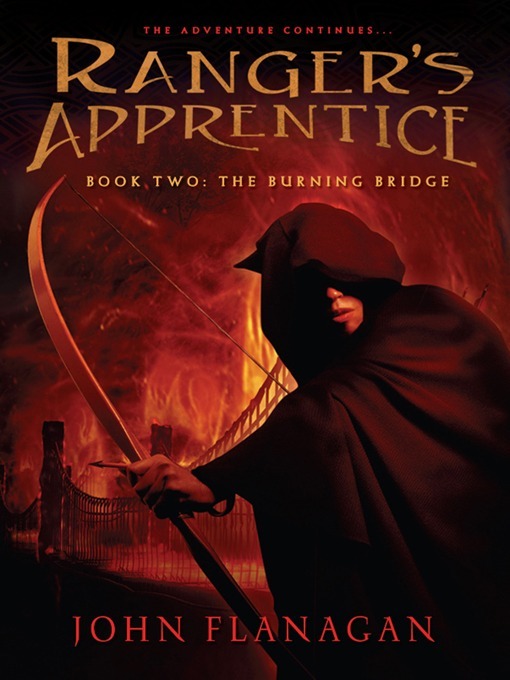 Gr 5-9 -In the second volume in this series, apprentice Ranger Will becomes involved once again in the war against the evil Morgarath. When he joins what should be a simple envoy mission, he and his companions realize that they are the only ones who know the extent of Morgarath -s duplicity, and it -s up to them to save the kingdom. Will and his friend Horace, along with noblewoman-in-disguise Evanlyn, make a dangerous journey and discover that Wargals, Morgarath -s mindless warriors, are infiltrating their kingdom, and their brave actions at the -burning bridge - of the title lead to Will -s and Evanlyn -s capture and much room for sequels. Will -s initial doubts and learning process add reality to his character, but his exploits never achieve true immediacy. Background characters are generally flat, though touches of humor add spice to the narrative. Flanagan creates a well-realized picture of life on the trail and its hardships, but his battles and their resolution seem almost too easy. Fans of the first volume will enjoy this adventure, but readers new to the series may not share their excitement." -Beth L. Meister, Pleasant View Elementary School, Franklin, WI"
Copyright 2006 School Library Journal, LLC Used with permission.